I'm in Seattle again this week, and every time I come out here, Eddie wants to know what kind of rental car I have. 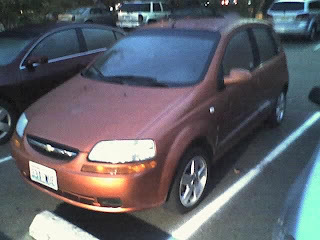 This time, I got a Chevy Aveo. I'm not normally a fan of Chevy, but this Aveo is pretty neat--definitely has a very European feel to it. 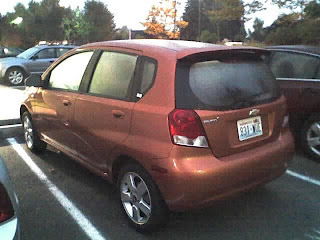 I like the metallic orange color, and the fact that it gets better than 34 mpg, but the boot is so small that I doubt if even Frank would fit in it!